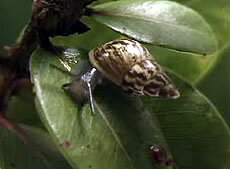 Oahu tree snails are found in the mountains of Oahu Island in Hawaii and face extinction in the near future. There were once over 40 recorded species of the snail, but now all but eight (possibly seven) species are now extinct. Several of the species only exist in captivity at the University of Hawaii. Snails are mollusks that have coiled or spiral shells covering their soft bodies, and the shells get bigger toward the opening as they grow. The shells of adult Oahu tree snails are smooth, glossy and conical in shape and are 17 to 24 mm in length with five to seven whorls. Colorations and patterns vary according to species. Tree snails move very slowly by alternating body contractions with stretching. Their bodies produce mucus that reduces friction on the surfaces allowing movement. When snails retract into their shells, they secrete mucus that dries to secure the entrance of the shell and to prevent it from drying out in dry months. Oahu tree snails are only found in the mountain ridges of Oahu Island where there are plenty of native shrubs and trees. 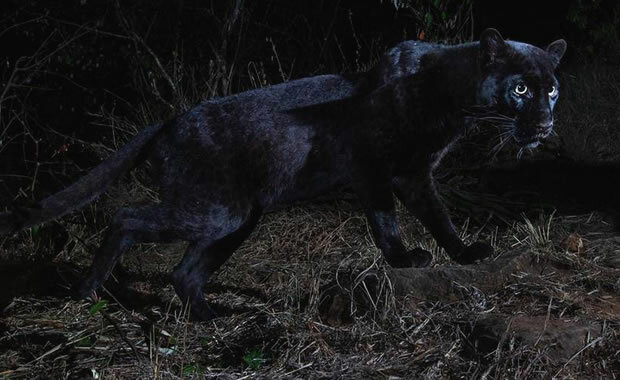 They are nocturnal, spending most of the day in the trees and can live their entire lives dwelling on one tree where they eat fungus that grows on the leaves. All snails are "hermaphrodites," possessing both male and female reproductive organs, but they still need to find another snail to mate with. When the mating pair meets, one snail pierces the skin of the other snail with a calcified "love dart." The exact purpose of this is not fully understood but it seems to stimulate the other snail into exchanging small packets of sperm. After mating is complete the snails will produce eggs internally, which are fertilized by the sperm that has been exchanged. Both adult male and female give birth, and they give birth to live young. Causes of decline include human settlement, overcollecting of shells, and habitat destruction. The species is also preyed upon by the introduced carnivorous snail, Euglandina rosea, which was originally introduced in the area to help control the population of another species of snail. A recovery plan has been drawn up in an attempt to save the species, and it involves the protection of its habitat and a captive breeding program that aims to introduce the snails back into the wild. Glenn, C. R. 2006. "Earth's Endangered Creatures - O'ahu Tree Snail Facts" (Online). Accessed 4/25/2019 at http://earthsendangered.com/profile.asp?sp=1023&ID=7. Need more O'ahu Tree Snail facts?